"Eric consistently provides sound legal advice in a timely manner. I appreciate his pragmatic approach to negotiations as we decide on those issues where we are willing to compromise in order to win on those that are the most important. Eric has great business instincts in addition to a rock-solid legal foundation." 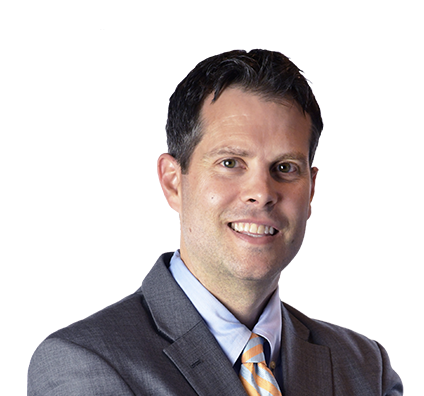 Eric represents construction and business clients from contracting through litigation and every point in between. He knows the value of getting a deal done right on the front end to avoid disputes on the back end. Eric builds lasting relationships with clients so he can focus on their objectives and help them address issues unique to their businesses. He regularly counsels clients on construction-related planning, contract review and risk mitigation. He also advises a multitude of other businesses, from manufacturing to software, on complex planning and risk management matters. An experienced litigator, Eric is comfortable taking matters to trial if it is in the best interest of clients. He has handled more than 20 trials in a variety of forums and achieved significant victories, including a defense verdict on a products liability jury trial when the plaintiff’s counsel sought 10 figures in damages in closing. Eric represented a company that acquired a significant portfolio of small-engine assets, including decades worth of intellectual property, in a multiyear lawsuit against the selling entity and its billion-dollar private equity parent corporation. At issue was whether the selling entity delivered all the assets included in the transaction. After a lengthy trial, the client was awarded a seven-figure monetary judgment and specific performance of the delivery of intellectual property. Handled multistate, multisuit complex litigation on behalf of premier catalog printing company related to fraudulent bribery and kickback schemes devised, orchestrated and implemented by nearly a dozen defendants, including two former sales representatives, printing service and product vendors, and industry competitors. Obtained preliminary injunctive relief and several other advantageous rulings that facilitated a significant financial resolution on behalf of client. Obtained stipulated dismissal without any consideration on behalf of former employee who was sued in federal court in Wisconsin on various claims, including misappropriation of trade secrets and conspiracy. Successfully resolved multimillion-dollar complex construction defect case. Represented architect in design services dispute involving project on campus of large public state university. Worked as part of team defending architect on one of the largest construction cases in Wisconsin relating to the roof for Milwaukee Brewers' stadium, Miller Park. Obtained defense verdict in jury trial on behalf of national elevator company in significant premises liability action. Modifications, Changes and Claims During the Construction Process, Half Moon Education, Inc.
Eric stays active with his four boys, cheers on Wisconsin sports teams and enjoys running. Eric and his sons participate in sports, play with Legos and try to maximize their time outdoors, weather permitting. 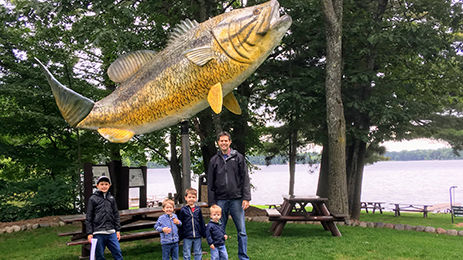 They visit a family cabin in northern Wisconsin where they enjoy fishing, swimming and kayaking. As graduates of the University of Wisconsin, Eric and his wife are enthusiastic supporters of the Wisconsin Badgers sports teams. They hold season tickets for football and are raising their kids as Badger fans. Eric has run the Chicago Marathon three times, although he is now focused on half-marathons and charity runs with his oldest sons. Eric helps families of 18-year-olds with disabilities navigate the guardianship process. For more than 10 years, Eric has worked with the Children’s Hospital of Wisconsin Guardianship Clinic to help families preserve their right to make decisions for their young adults with disabilities. Eric supervises and coordinates Husch Blackwell’s pro bono contributions to the clinic and volunteers on various cases throughout the year. Eric participated in a case trial “boot camp” that gave him the hands-on experience to be a successful litigator. Eric was appointed as a special prosecutor with the Milwaukee County District Attorney's Office in the General Crimes Division in summer 2007. While on loan from the firm, Eric spent roughly 12 weeks handling misdemeanor cases. He tried cases before multiple judges and juries and handled motions, plea bargains, sentencings and reconfinements. Eric had to quickly learn his cases, execute plans and be ready to try multiple cases on any given day. He polled jurors after trial for insights on how they arrived at their decisions. The program gave Eric experience in a rapid-fire environment before witnesses, opposing counsel, juries and judges and required that he deal with circumstances outside his primary practice. The experience helped him quickly identify what was important to a case, execute in a limited time frame and connect with the jury or judge to attain the desired outcome.